The K6 Red Phonebox is a classic design by Sir Giles Gilbert Scott who amongst other notable buildings also designed Battersea Power Station. The K6 “Jubilee” model pictured here was built to commemorate the Silver Jubilee of King George V in 1935. 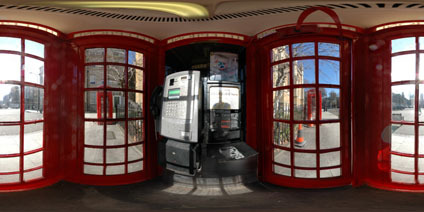 We used the term ‘building’ to describe the phonebox as the picurted K6 can be found at Byng Place in Bloomsbury London and is uniquely preserved as a Grade II Listed Building. Note – apologies for the dismal ‘Load’ button, Flashificator is proving temperamental..
It’s the tightest pano I’ve ever seen. Can I ask what setup did you use for this? I used a normal tripod and a Nodal Ninja head with a Nikon D80 10.5m lens – so 6 shots and one up, one hand held down. It was a bit of a squeeze!